And all those Egyptians, Sumerians, Babylonians, Assyrians, Jews, Phoenicians, polytheist and Christian Greeks, polytheist and Christian Romans, Achaemenid, Parthian, Sassanid Iranians of the entire Irano-Central-Asian plateau, Aryan peoples of the Hindus valley and north India, Christian North Africans, Sicilian Catholics and Greeks, Franks and Normans, Iberian Visigoths, Flemings, Provençals, Occitans, Venetians, Florentines…..all waiting around millenia, the poor savages, for the Light of the Hejaz to shine on them in the darkness. Cool: Arabs discovered the Western Hemisphere along with everything else. See Times article: “‘Allah’ Is Found on Viking Funeral Clothes“. Protesters are demanding the removal of Patriarch Theophilos III over his involvement in selling church land. Hundreds of Palestinians rallied on Saturday in occupied East Jerusalem against the selling of church property to Jewish settlers. Protesters demanded the removal of Patriarch Theophilos III over his involvement in selling church land and called for an end to Greek dominance over their church. “The people are demanding unity, transparency, and not to Arabise the church, because the church is already Arab Palestinian,” Ayman Odeh, head of the Joint List in Israel’s parliament, said in a statement at the protest. “In the 21st century, we are here are to ensure that this a national cause. We are here to say there are those who aim to transform the conflict from a national one to a religious one. This is a conflict between illegal occupation and between the people of Jerusalem – Christians and Muslims,” Odeh added. The rally comes amid fears in the Palestinian Christian community that Israel is attempting to “weaken the Christian presence” in the country. In a joint statement released this month, patriarchs and church leaders in Jerusalem expressed their concern over what they termed “breaches of the status quo that governs holy sites and ensures the rights and privileges of churches”. The statement condemned a recent Israeli court ruling over the selling of two strategically located hotels near Jaffa Gate in the Old City and a large building in the Muslim Quarter to the Israeli Jewish settler group, Ateret Cohanim, which aims to expand the Jewish presence in the occupied city. The court approved the sale in early August, giving Ateret Cohanim rights over the property for a period of 99 years. 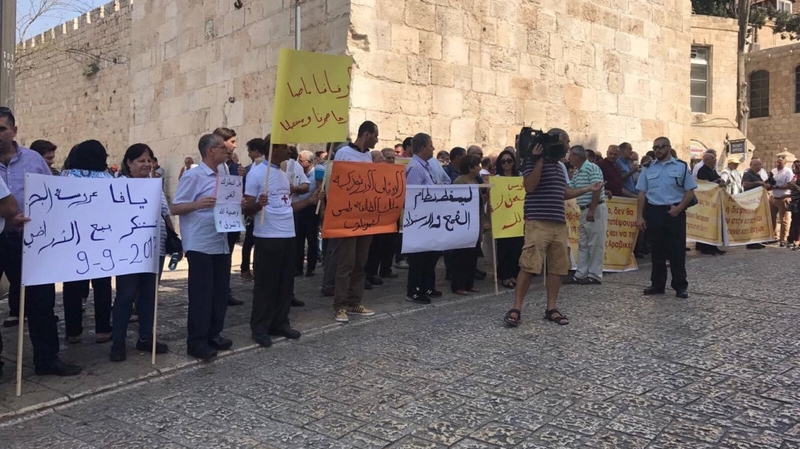 “The judgement in the ‘Jaffa Gate’ case … which we regard as unjust, as well as [a] proposed bill in the Knesset which is politically motivated that would restrict the rights of the Churches over our own property, are further assaults on the rights that the status quo has always guaranteed,” the statement noted. The patriarchs and church leaders also vowed to support a high court appeal against the judgement and called on fellow church leaders around the world to stop further attempts to change the status quo. The Greek Orthodox Church is the second-largest owner of land in the country. The controversial deal between the church and Ateret Cohanim was made in 2004 and came to light a year later. Although the deal was initiated by Theophilos III’s predecessor, Irenaios, who was deposed from his position for his actions, activists and residents believe Theophilos III was responsible for concluding the deal with the settler organisation. “The Patriarch will continue to use bribes. We will not allow these bribes to continue. This church is an Arab church and its administration should be Arab. The Patriarch must be an Arab – whether Palestinian or Jordanian. We will not accept anything else,” Alif al-Sabbagh, a member of the Arab Central Orthodox Council in Palestine and Jordan, told Al Jazeera at the protest.